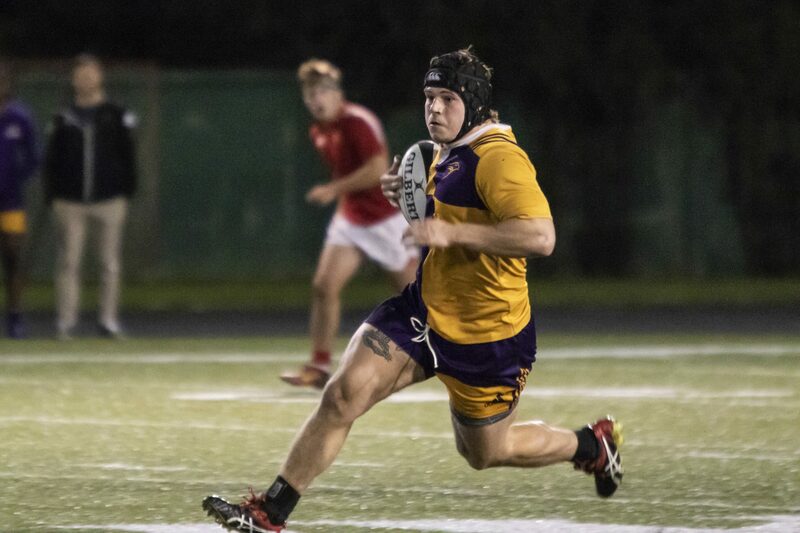 With the OUA playoffs right around the corner, the Wilfrid Laurier University’s men’s rugby team need all the momentum they can get. They got some much needed momentum with a record-breaking win against Brock on Saturday, Oct. 13. The Golden Hawks dismantled the Badgers defence en route to an emphatic 123-0 victory. The 123 points scored by the Hawks is the highest total in the team’s history. The Hawks were up by 64-0 at halftime and they continued to pile on the misery in the second half. Holland Landing, Ont. native Andrew Quattrin led the purple and gold by scoring five tries. The fifth year star became just the second Laurier rugby player ever to score five tries in a single game. Matt Fish and Cameron Sandison also excelled on the day, chipping in with three and two tries respectively. The Hawks are now on a five game winning streak, bringing their overall record to 6-1, with their only loss coming against Queens, who are the defending OUA champions. The Gaels were the team that knocked the Hawks out of the OUA playoffs last year, so it seems likely that we will see this matchup again in the playoffs this year. What makes this five game winning streak even more impressive is the manner in which the Hawks have simply dominated their opposition. Over their past five games, Laurier has outscored opponents by a combined score of 369-50. The Golden Hawks are now tied for second place with Guelph in their conference standings. This makes their last regular season game against the Gryphons that much more important. In what should be an exciting regular season finale, the winner of that game will take sole position of second in the standings and the victor will also get a first round bye in the playoffs. Considering the fact that the Hawks have one of the best home field advantages in the country, a victory is imperative for Laurier in order to at least secure home field for the OUA semifinals. The Hawks won their first playoff game in over 15 years last season, and now they have broken their single game points record. The growth of this team has been a direct result of a combination of talent, hard work, and phenomenal coaching. It’ll be interesting to see how they perform when things get tougher in the 2018 OUA playoffs. Laurier’s final regular season game against Guelph is set for kickoff at 1 p.m. on Saturday, Oct. 20 at University Stadium.